The term Necromancy is defined as the art of communicating with the dead to predict the future, but in Oblivion this is extended to include the study and the act of raising the dead. The most prominent practitioners of Necromancy in Oblivion belong to the Order of the Black Worm, a cult that involves the fanatical followers of the powerful wizard Mannimarco who aid him through forging black soul gems for his ultimate cause: the destruction of the Mages Guild. This is done by waiting for the cooperation of the stars to shine their light on the unholy necromantic altars, then placing an empty Grand Soul Gem into said altars and casting a Soul Trap spell on it. This is the only way (short of finding them) to obtain the necromantic Black Soul Gems, capable of trapping the souls of men and mer at their passing into the next realm. Because of Necromancy's immoral practices, the current Arch-Mage Hannibal Traven has banned it from the guild and excommunicates anyone who openly practices it. 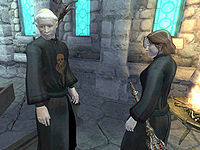 Though that is not the only reason: legend has it that many years ago, before the founding of the Mages Guild proper when there were only very scattered universities of magic, the first Arch-Mage Galerion the Mystic and Mannimarco were once students together. No one knows how they grew to be rivals but we do know that—over time—they did, culminating in a battle between the two. Despite Galerion's victory in the battle, Mannimarco bound his spirit to the living world so that after he regained his strength and his number of followers, he would then rise again as the King of Worms. Upon rising, he would challenge the Arch-Mage for control of the Mages Guild and the power granted therewith, bringing us to the predicament the Mages Guild is in today. More information on the background of Mannimarco and necromancy can be found here. Because of the growing problem of necromancy as it relates to the Mages Guild you may be asked to help out in any way you can, assuming you can prove yourself capable. The following are all of the quests relating to necromancy. At lower stealth, your bow would be your best bet, as necromancers always summon an undead minion usually allowing you to get off more than one stealth shot, probably killing them right there. However, if you are less than competent with a bow then Silence poisons work wonders. Other than that, they will probably try to run when you get close. Try to back them into a corner if you can. At high levels of stealth, they usually go down with a single 6x hit from a longsword with 20 or more fire damage. Simply close the distance as quickly as possible and try to kill them before they get their first spell off. Silence spells are your best friend here and other than that it's fairly straightforward. However, invisibility may not work; this occurs when you are still within close range of the enemy in question when you cast the spell - moving away should work. Chameleon is also effective, providing you have a decent leveled spell or enchantment. A very useful spell for taking out a generic Necromancer is Drain Health 100 points for 1 second. Many have less than 100 hit points so it will take them out in one shot, even those that do have more than 100 health only take one or two hits to reduce them below 100 and then you can cast it again. They seem to be more inclined to summon minions rather than heal themselves unless their health is very low, so ignore the summoned creature and keep attacking the Necromancer. Summoning another creature yourself is a good way of distracting their minion from attacking you, leaving you free to focus your attacks on the Necromancer. Another way is to use a turn undead spell on the summoned undead to get it out of the way while you proceed to kill its master. Don't waste time on killing the creature as the necromancer will just summon another immediately after one has died. This is a list of known Necromancers in the game, along with where to find them. Here's a list of caves and ruins containing unnamed necromancers. Esta página foi modificada pela última vez à(s) 21h41min de 1 de abril de 2013.